A New Jersey auction centre will hold its first 20th Century Design sale of 2012 on February 25-26. A heady blend of antiques from private collections, museums and directly from the creators is to be offered with full internet bidding available. Featured is the, master blacksmith, which includes some of the finest Philadelphia Arts and Crafts ironwork to come to market in recent years. "Each auction has its own personality based on the consignments that happen to come in," said auctioneer David Rago. "At some level it's really beyond your control. This next sale, for some reason, includes the best selection of Philadelphia Arts and Crafts wrought-iron we've ever seen on the market." 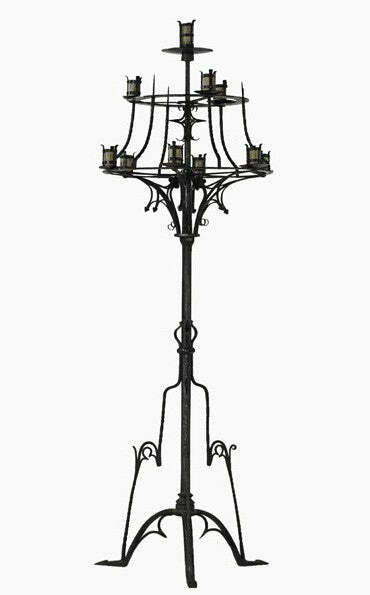 Fittingly, the main wrought-iron collection belonged to blacksmith Peter Renzetti, who was clearly taken with the more artistic side of his work. Some of that which is included comes from Samuel Yellin and his workshop, but there are other pieces from the Arden Community too, not to mention J. Barton Benson and Parke Edwards. A Delaware collector has also offered 44 lots of metalwork. The most impressive Samuel Yellin piece is undoubtedly a huge candelabrum. Created in the 1920s, it has never travelled that far from the artist, as it was gifted to Renzetti by Clare Yellin. Some traces of candle wax remain on the piece, which is an inevitable consequence of normal use, but nothing has happened to it which makes it less impressive than the day it was made, and it carries an estimate of $18,000-24,000. Sunday's auction includes some rare and covetable pieces of sculpture, lighting and art glass, and concludes with contemporary art.